What Happened the Morning of the Atomic Bombing of Hiroshima? This year marks 70 years since the dropping of the atomic bomb on Hiroshima. What happened that morning of August 6, 1945 was a destructive force never witnessed before with the exception of the secret Trinity test held a fortnight earlier in the Jornada del Muerto desert of New Mexico. The world has simply never been the same and never will be. Over the years much has been written about the Manhattan Project that built those first nuclear bombs as well as the awful aftermath that the citizens of Hiroshima suffered. However, the events of the actual mission as it unfolded are less well known. The vagaries of the weather that August morning sealed the fate of four cities. Three survived and one was obliterated. 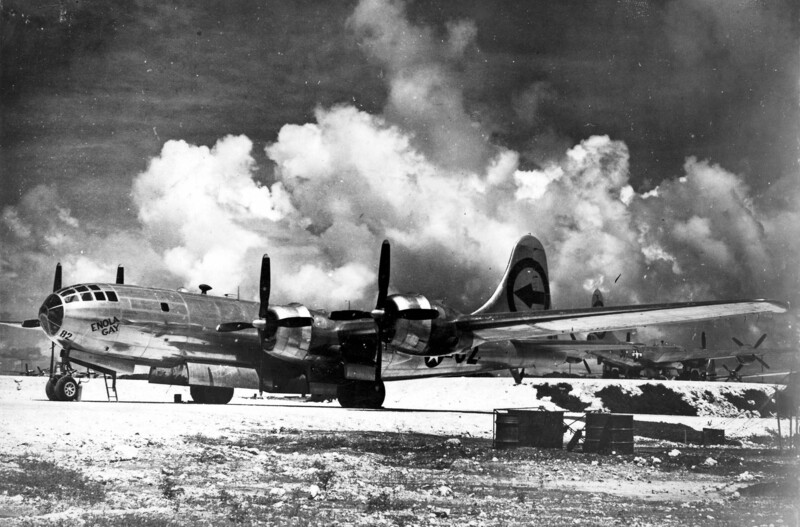 At approximately 2.45am on August 6, 1945 USAF pilot Colonel Paul Tibbets, taxied the silver Boeing B-29 Superfortress towards the end of the floodlit runway ‘A’ at North Field, Tinian Island in the Mariana’s. When the huge bomber named ‘Enola Gay’ after Tibbets’s mother, reached the end of the runway it turned 90 degrees and was pointed in the direction of the Japanese islands some six hours’ flight time away. At the controls Tibbets and his co-pilot Captain Robert Lewis carefully built the four Wright R-3350 engines to the roar of full power, released brakes and slowly began to lumber down the 2,500-metre runway. The Enola Gay was 7,500 kilograms overweight due to the heavy fuel load and the weight of its onboard ordinance that morning. It took every ounce of horsepower, every metre of tarmac to get the 60,000 kg aircraft airborne. Thirty seconds later USAF Operations Order No. 35 was rising into the inky blackness of the northern Pacific skies on an initial flight path to Iwo Jima where it rendezvoused with mission support aircraft whose primary role would be to document what happens over the next few hours on film and through scientific telemetry. Three other supporting B-29s had left Tinian an hour earlier to conduct weather reconnaissance over the selected targets on the Japanese mainland. From Iwo Jima, the Enola Gay and its two support aircraft veered eastward towards the island of Honshu and increased their cruising altitude to 9,500 m and settled into a sustained speed of around 200 knots. What many people don’t realise is that even at that midway point in the mission, the flight crew of the Enola Gay did not yet know exactly where the target was going to be. What many people don’t realise is that even at that midway point in the mission, the flight crew of the Enola Gay did not yet know exactly where the target was going to be. They had onboard “the gadget”, a single bomb ordinance called “Little Boy”, yet they had up to three other possible alternate targets. Though the prime target was Hiroshima in the early hours of August 6, 1945, the first operational atomic bomb used in warfare could have ended up elsewhere. For example, if the city was too overcast or too windy that morning, the bomb might have fallen on Yokohama, Niigata or Kokura, which were deemed the alternate mission targets. High over the city of Hiroshima at around 7am, one of the mission support aircraft flew a reconnaissance course and an air raid siren rang out around the city. The aircraft called Straight Flush sent through a radio message, which was picked up by Enola Gay. “Cloud cover less than 3/10th at all altitudes. Advice: Bomb Primary.” On the ground an all-clear siren was sounded ten minutes later and soon the people of Hiroshima once again continued to go about their lives, walking to school, eating breakfast, opening their stores, catching their tram to work. To them, August 6 would be just another day. Two hundred miles away flying over the Pacific, the Enola Gay had the prime target confirmed. It was 7.30am. The target was the T-shaped Aoio bridge in the central business district of Hiroshima. At 8.10am the crew of the Enola Gay lined up for their bombing run and Colonel Tibbets switched over to the onboard autopilot. Control of the mission at this point was now handed over to the aircrafts bombardier, Major Thomas Ferebee who would aim and release the bomb. It was only five minutes later that the Enola Gay arrived over the target at an altitude of 9,470 m. Ferebee calibrated aim-sight crosshairs, lined up the Aoio Bridge and released the bomb. It was 8.15am local time. Little Boy took 43 seconds to free-fall to the predetermined detonation height of 600 m above the target, where barometric triggers initiated the firing mechanism and detonated an explosive force equivalent to 15 kts of TNT inside the steel casing of Little Boy – a uranium gun-type atomic weapon containing 64 kg of enriched uranium. Immediately on detonation, X-ray-heated air created a 6,000°C fireball that was almost 400 m in diameter, generating a five psi pressure wave at a velocity greater than the speed of sound, that fanned out in all directions. It simply vapourised people to the point that all that was left of them was a shadow burnt into the concrete where they stood. Little Boy destroyed completely everything within a 1,600 m radius and created a firestorm that was 3 km in diameter. Over 70% of the buildings in the urban area that was around 12 km2 were destroyed. Approximately 70,000 people or over a third of the population were killed instantly as a direct result of the Hiroshima blast, with 60% of immediate deaths were caused by the firestorm. Some 50,000 of those killed were regular citizens, many of them children or the elderly. A further 70,000 were injured. Many receiving lethal doses of nuclear radiation and would die in the months and years ahead. In those 43 seconds from the bomb release to the point of detonation the Enola Gay had traveled 18.5 km from the point of ground zero before the crew felt the shock wave turbulence from the blast rocking the aircraft. It was then that Colonel Tibbets got on the aircraft’s intercom and reported to the crew “Well, boys, you have just dropped the first atomic bomb in history.” As the aircraft raced back across the Pacific to the Mariana’s on that clear blue morning the crew were still able to observe the infamous mushroom cloud rise above the city to a height of almost 13,000 m some 360 km away. After 12 hours of mission time the Enola Gay and her crew touched down on Runway ‘A’ at Tinian. It was at 3pm. USAF Operations Order No.35 was completed. Three days later the second atomic bomb dubbed ‘Fatman’ was dropped on the Kyushu city of Nagasaki with comparable lives lost and damage done. It was a terrible end to a terrible war that never bears repeating, but bears all of us to always remember. Michael Liam Kedzlie is a New Zealander who currently works as the Research and Policy Manager, based in IAFOR’s Nagoya office. He is responsible for formulating legal policy as well as liaising with the organisation’s university partners and the International Directors of Program. He is also editor of Eye Magazine. He has worked in the tertiary education sectors in both New Zealand and Japan and has in the past worked as a Parliamentary Assistant for a New Zealand MP, as well as in the New Zealand Tourism Industry. Michael has a Master’s degree in Education from Massey University as well as a Law degree from the University of Waikato Law School. He is an enrolled Barrister and Solicitor of the High Court of New Zealand and has broad interests within the Law, Public Policy and Politics. 04.26.16Why Did France Beat Japan to $40-bln Australian Submarine Contract? 03.28.16New Zealand’s 2016 Defence White Paper: Will there be change or will things stay the same? 12.01.15Is it time for International Humanitarian Law 2.0? 10.04.14Why Does Japan Value its Whaling Industry Over its Reputation?